The Horse in Ancient Greek Art from NSLM on Vimeo. 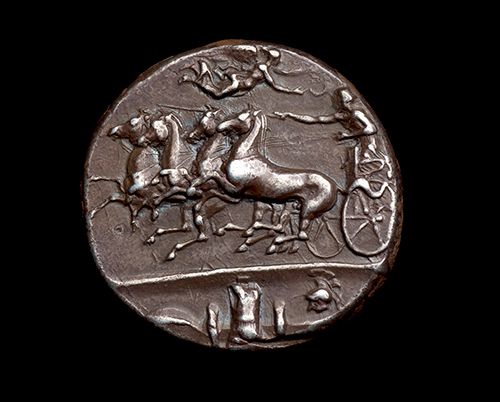 From myth and legend, to warfare and transportation, to leisure, sport, and Olympic competition, the horse played an integral role in ancient Greek culture. 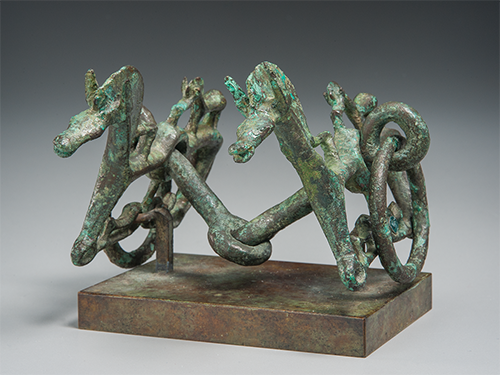 As symbols of wealth, power, and status, horses appear on the finest examples of ancient art and pottery. 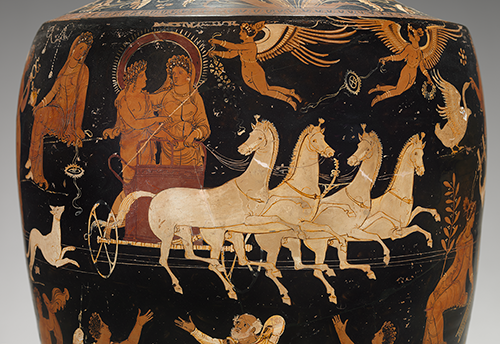 Imagery of both mythical and real horses fill Greek mythology, legend, and history and appear throughout ancient art. 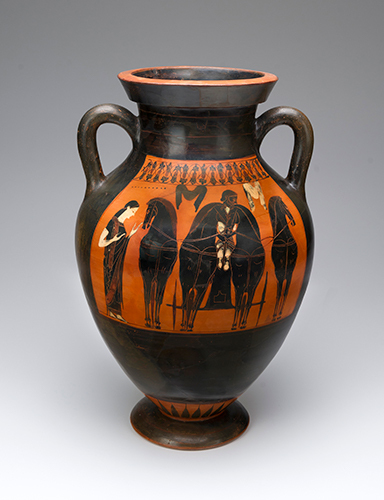 Vase-paintings depicting chariot horses being harnessed, jockeys riding, and grooms tending to well-bred steeds celebrate ancient sport and competition. Scenes of the care, training, and competition of the ancient sport horse and ancient texts on the Greek art of horsemanship bear striking resemblances to the horsemanship of today. 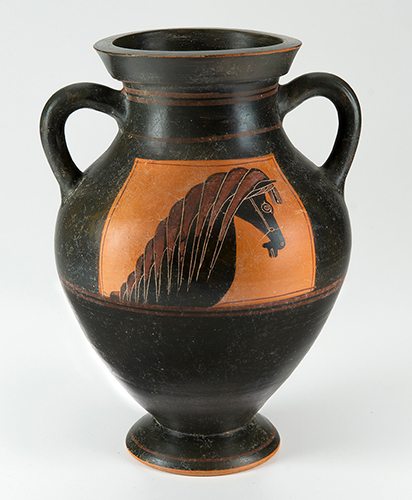 The Horse in Ancient Greek Art features Greek vases, sculpture, and coins from the 8th through the 4th centuries BCE drawn from private collections, the Virginia Museum of Fine Arts, the Tampa Museum of Art, and other museum collections. 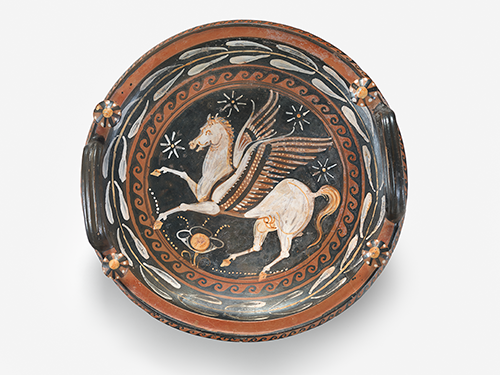 The exhibition and accompanying publication explore the significance of the horse in ancient Greek culture, and imagery of the horse in ancient myth, war, sport, and competition. 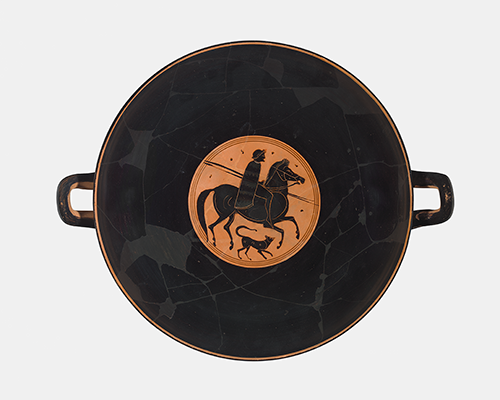 From some of the earliest examples of the horse in Greek art, to stunning examples of black and red-figure vases, the objects on view illustrate ancient equestrian life. 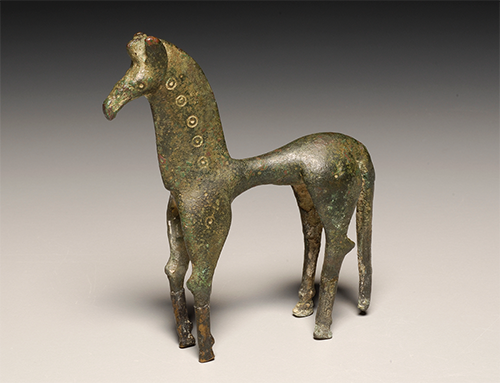 The exhibition begins with early images of horses on objects from the Geometric Period (c. 900–700 BCE), named for the geometric patterns and intricate designs found on artwork from the era. From there, objects from the Archaic through the Classical Period (which ended in 323 BCE) are organized by key subjects. Myth and legend are illustrated with mythological horses and horse-hybrids, such as the famous winged-horse, Pegasos, and centaurs. The horse in war is depicted with scenes of ancient cavalry and chariots, followed by hunting, which was considered good training for both war and for competitive events. Horsemanship is explored with images of grooms tending their charges and examples of ancient tack. 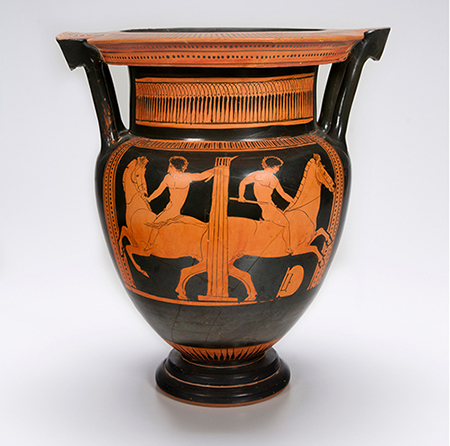 Finally, vases and coins showing equestrian sport reveal the significance of competition in the ancient Greek world and highlight the skills and accomplishments of ancient equestrians. Published by the National Sporting Library & Museum in partnership with the Virginia Museum of Fine Arts/Distributed by Yale University Press (September 2017). Edited by co-curators Nicole Stribling, the Curator of Permanent Collections at the National Sporting Library & Museum and Peter Schertz, the Jack and Mary Ann Frable Curator of Ancient Art at the Virginia Museum of Fine Arts. 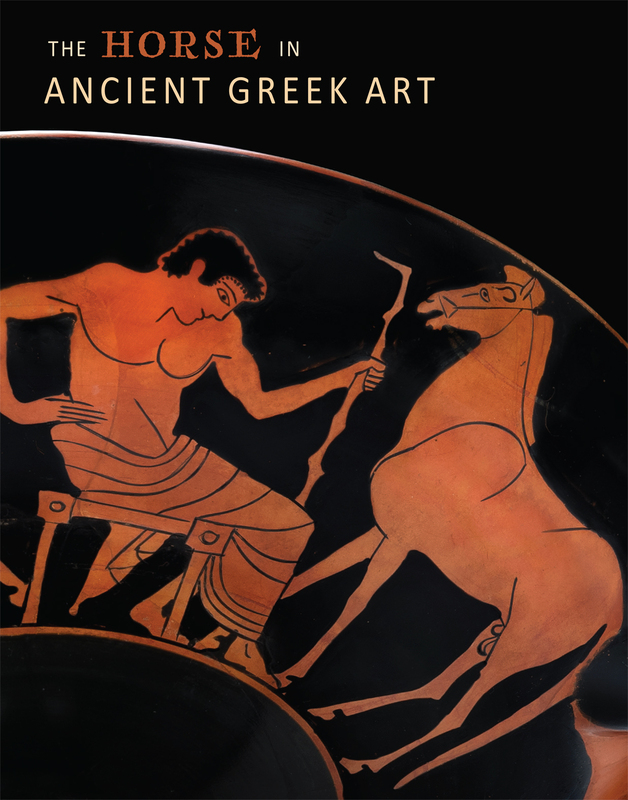 The fully illustrated publication features essays by notable scholars of ancient Greek art and archaeology: Seán Hemingway, Curator, Greek and Roman Art, The Metropolitan Museum of Art; Carol Mattusch, Mathy Professor Emerita of Art History, George Mason University; John Oakley, Chancellor Professor and Forrest D. Murden Jr. Professor of Classical Studies, The College of William and Mary in Virginia; Seth D. Pevnick, Chief Curator and Richard E. Perry Curator of Greek and Roman Art, Tampa Museum of Art; and exhibition co-curator, Peter Schertz; with an introduction by co-curator Nicole Stribling.